The clean lines of the Helios Bar Stool provide this piece with timeless appeal. A solid wood seat adds warmth to any room, while the metal legs add a modern edge. This stool offers function and style at your kitchen island or bar area. 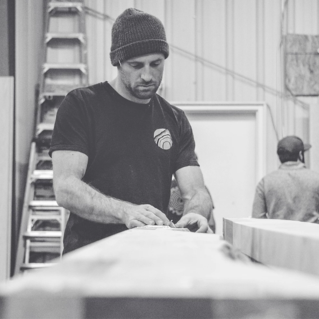 Garrett Brown Designs creates furniture, custom interior spaces, and art inspired by nature in Denver, CO. Garrett sold his car to buy tools, source wood and start the furniture manufacturing company years ago. Today, he runs a 3,500 sq. ft. shop in Denver and employees several local craftspeople. His pieces incorporate mixed media, combining the warmth and beauty of wood and stone with the slickness of metal, steel, acrylic, or concrete. He is constantly designing and searching for new perspectives. His free spirit has taken him to Costa Rica, Japan, remote areas of the United States, and beyond.